In case you haven’t noticed, the far left has taken control on the campuses of many American colleges and universities. This development hasn’t worked out well in a number of ways, but the effect on free speech has been particularly troubling. The left doesn’t only want to stifle conservative speakers on campus, they want to control the very words you use. It’s an ironic charge, considering the vast majority of people who are shutting down free speech on college campuses are members of the left. Consider recent history. 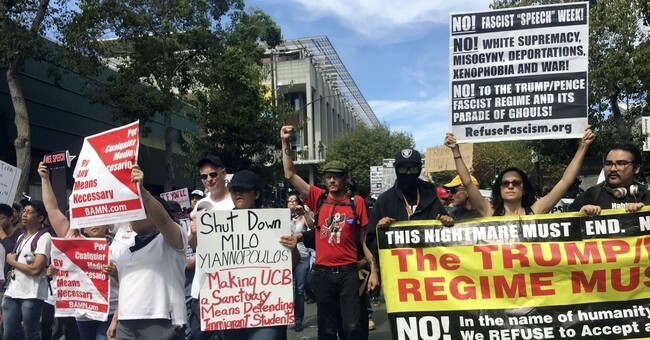 In February of 2017, left wing activists at UC Berkeley acted out violently, and caused thousands of dollars in damage to stop a speech by Milo Yiannopoulos, who had to be escorted off campus by armed security guards. One month later, the scholar Charles Murray was set upon by a campus mob during an event at Middlebury College in Vermont. Unhinged leftists screamed “Charles Murray go away! Racist, sexist, KKK!” They became so out of control, they sent a member of the faculty who was there as an event sponsor to the local emergency room where she was fitted for a neck brace. Since then, there have been multiple incidents like these and they always seem to happen when a conservative is invited to speak on campus. It has happened to Ann Coulter, Michelle Malkin, and Heather Mac Donald of the Manhattan Institute, to name a few. Even Ben Shapiro, who is Jewish, has been accused of being a “Nazi” by the campus left, despite the fact that the Anti-Defamation League found him to be the most targeted person in journalism for anti-Semitic attacks in 2016. Conservative and libertarian student groups like Young America’s Foundation and Turning Point USA, routinely face obstacles when trying to bring their preferred speakers to campus. Sometimes, schools even try to charge them massive security fees rather than dealing with the left wing activists on campus who present the real threat to safety. The left has no interest in the free flow of ideas, they want control. Consider what is happening at the University of Minnesota right now. A new school policy under consideration would make using someone’s “wrong” pronoun a potentially fireable offense. The left will tell you this is about tolerance in one breath, while calling anyone who disagrees, a Nazi in the next. Is it any wonder why so many left wing politicians like Elizabeth Warren and Bernie Sanders want to make college “free” for everyone? This is where their political foot soldiers are born. If the United States made college “free,” we would be living in a country where Trump-supporting taxpayers subsidize many of their political opponents. Does that sound “fair” as the left likes to say? The sad irony is that American taxpayers are already underwriting this pyramid scheme through federal loan programs, which now represent over a trillion dollars of debt. When do the people get to weigh in on this issue? The government keeps telling us to open our wallets wider, as the beneficiaries of our taxation are inclined to call many of us fascists for not using the right pronouns, supporting Trump, believing in limited government, free speech or even merely loving America. Colleges and universities are not listening to the taxpayers. In fact, in most cases they side with left wing campus activists. For proof of this, look at the money they spend catering to them with pointless administration hires. Schools spend exorbitant amounts on “diversity and inclusion” administrators, then clueless student activists protest the rising cost of tuition. If the American people allow Democrats to make college “free” we will have only ourselves to blame when the bill comes due. Picture Bernie Sanders and Elizabeth Warren standing next to your brother’s totaled car like Otter and D-Day in the 1978 film Animal House.